What developments in robotics have happened this week? Too many to mention in this space, so unless you are a psychic bot, better read on to find out. Your skin is your biggest organ, though you may never think of it like that, and it deluges your brain with a constant feed of sensory data. But when you think of robot skin, you’re probably imagining plain metal or plastic or some skin-simulating effect on the Geminoid robots. That’s something German researchers at the Technical University in Munich want to change with their sensitive skin for robots. It’s an intelligent material that’s put together in plate-like segments to cover the exterior of a bot, providing it with localized proximity sensors, accelerometer-based impact sensors, and temperature sensors. The skin could let a robot retreat–in the right direction–after an impact, work out if its approaching a hazardous environment, or even help it navigate. We imagine this is exactly the kind of neat tech the amazing new planar imaging system could help with. 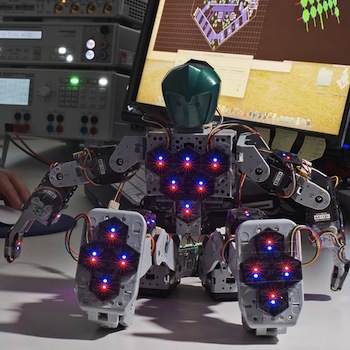 Robot football games are used as a technical tour de force to show off the state of the art in programming–which is something the Darmstadt Dribbler team is doing to the max. That’s because instead of the usual slow-paced limited kick-dribble-save behaviors these diminutive androids can manage, the team has worked out how to let them throw the ball in when it goes out of bounds, and also manage sophisticated autonomous passing, much closer to human player’s skills.Bend it like Robeckham, indeed. We know iRobots war droids have been used in the cleanup/investigation of the decimated Fukushima nuclear reactors in Japan, but engineers there have taken the Doctor Who approach to improving their utility and have hacked a Warrior tracked robot to help vacuum up contaminated solids and fluids. Essentially they’ve attached the hose end of an industrial vacuum machine to the Warrior’s arm, and are using it by remote control in places that no human would (currently) dare to tread. Possibly the future of chocolate…possibly a gimmick, but wholly amazing: Scientists at Exeter University have taken the current vogue for 3-D rapid prototyping and applied it to a 3-D chocolate printing robot. The retail applications are amazing, and chocolates you buy to say “sorry” in the future really could be saying sorry. The Future Of Robo-Aided Brand Adverts? This isn’t a real robot, and it isn’t officially sanctioned by Nike, but Big Lazy Robot Visual Effects put together a clip that shows how robots may find a role in brand promotion in the adverts of tomorrow. It’s old, we know, and it sounds crazy, but it’s worth popping in here because it’ll help you think differently about how robots will influence our lives. 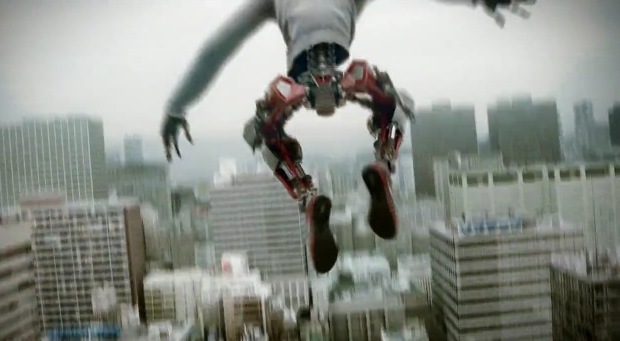 Watch the clip because it has a simulated android doing the kind of parkour free-running that a real, highly flexible machine could one day easily do…and which our frail human bodies could never match.